While my husband and I were honeymooning in jolly old Londontown two years ago, I had every intention of trying all the traditional English dishes. On my list were Yorkshire pudding, cottage pie and a scrumptious Sunday roast. But after my first (attempt at a) pint of ice cold lager and plate of fresh fish and chips, I was smitten. It was practically all I ate for the next four days. Thank GOD for all the walking we did! This amazingly delicious recipe for fish and chips took us right back to all the warm, lively pubs we visited in the West End, London’s hip and happening hub for good food and tons of things to do. Battered in a mixture of beer and flour, the fried cod was tender, flaky and melt-in-your-mouth tasty. The russet potato “chips”, or fries, were simply coated in a little salt and pepper before crisping up in the big pot of bubbling oil. For this recipe, I used a large Le Creuset Dutch oven and a candy thermometer ($9 from Target), which was necessary to keep track of the oil temperature. My first deep-frying experience was easier than expected and yielded incredibly tasty results. I know you will enjoy these fish and chips so much and agree that it’s one mouthwatering English meal! In a 5 quart Dutch oven, heat oil to 375 degrees F.
In a large bowl, pour in 1 bottle of beer. Sift 1 1/2 cups flour into the bowl, whisking in gently until just combined, stir in salt, pepper and garlic powder. Pat fish dry and season on both sides with salt and pepper and coat the fish in the beer batter. Dredge the pieces of fish in 1/2 cup of remaining flour and slide into oil as coated. Fry fish, turning over frequently, until deep golden and cooked through, 4 to 5 minutes. Transfer to a paper towel-lined baking sheet and keep warm in oven. Fry remaining fish in batches, returning oil to 375 degrees F between batches. 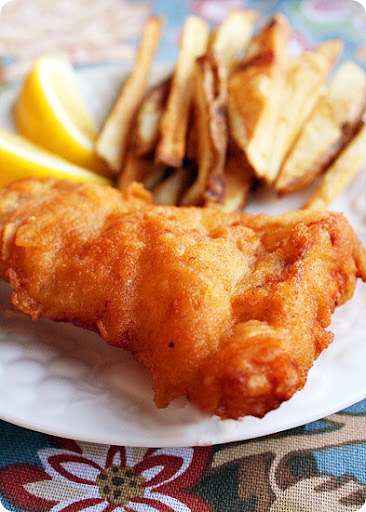 Serve fish with French fries, and if desired, tartar sauce and/or ketchup, malt vinegar and lemon wedges. This entry was posted in All Purpose Flour, Black Pepper, Cod Fillets, Cod Fish, Cooking, Cuisine, Dinner, Eating, Food, Garlic Powder, Herbs & Spices, Kosher Salt, Seafood, Vegetable Oil. Bookmark the permalink. I’m making this for my wife … as soon as she gets back from London! This looks wonderful and fish is one of my very favorite food things! Enjoyed the post and loved the quote, too!